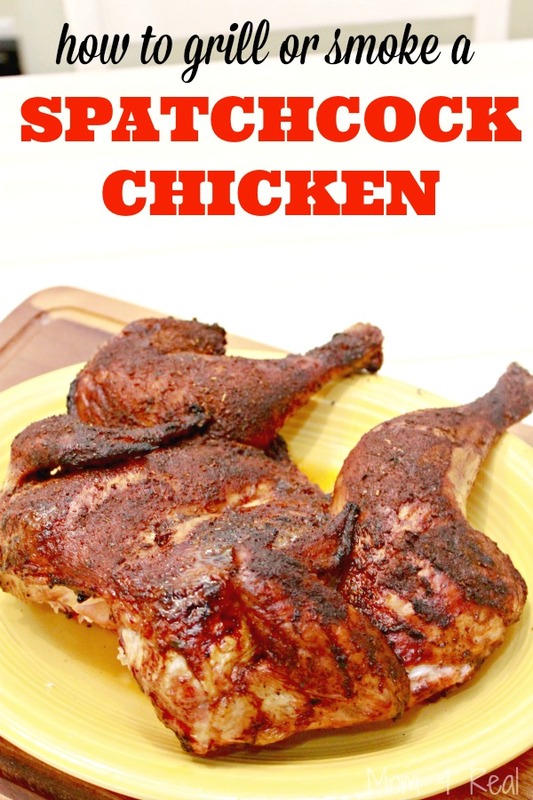 How To Grill or Smoke A Spatchcock Chicken – The Juiciest Chicken Ever! 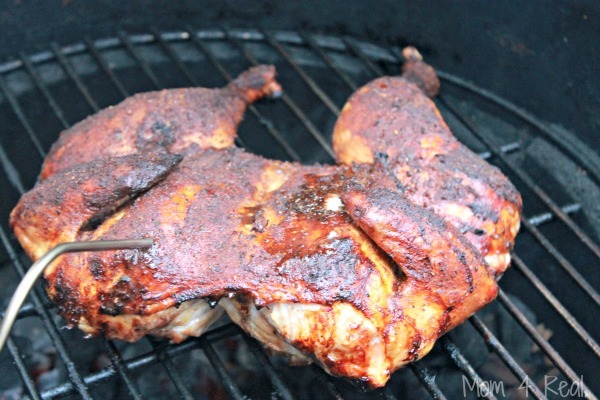 Grilling chicken just got even more fun, and grilling a spatchcock chicken will be your new favorite way to grill or smoke chicken. It is juicy and delicious! Start with a 3-4 lb. whole chicken. Feel free to cook more than one for sure. In fact, you could always use a bigger chicken, you will just have to grill it longer. You will need to use either a pair of kitchen shears or a really sharp knife to cut the backbone out. 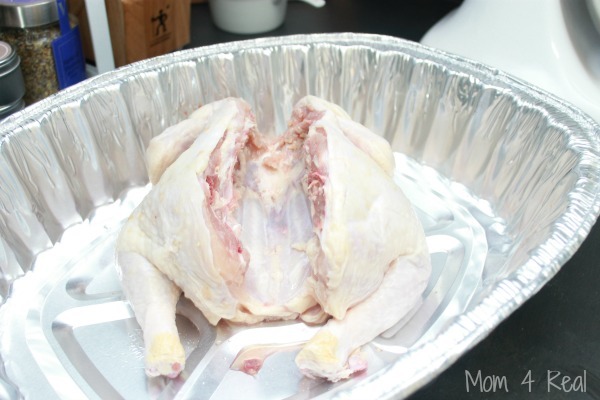 Simply place your chicken breast side down, and cut along one side of the backbone. BE CAREFUL! Once you have one side cut away, cut down the other side of the backbone and remove. 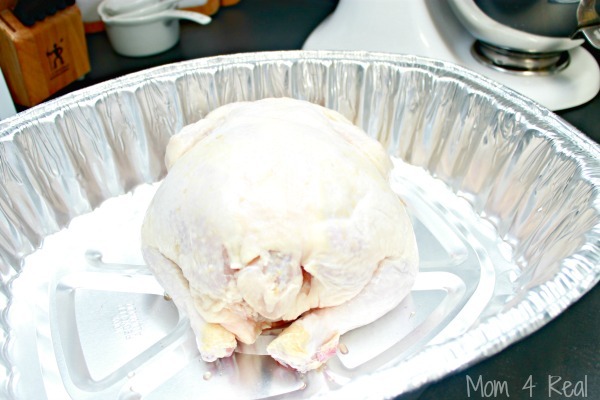 Turn your chicken over and push down on the middle until it lays flat. You have just spatchcocked your chicken…whoop! Now you will want to season your chicken. This time I used my Dizzy Pig Dry Rub, but I can see using so many different rubs, like lemon pepper, sea salt and rosemary and so many more! You will need to get your grill or smoker up to about 375 degrees Farenheit. 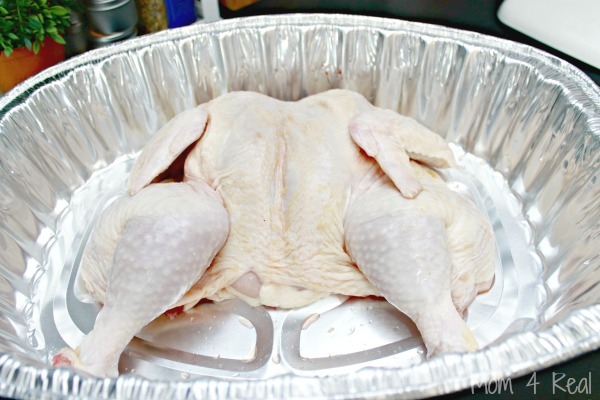 Place the spatchcocked chicken flat on the grill grate and cook for one hour or until a meat thermometer registers 160 degrees Farenheit when stuck in the thickest part of the breast. 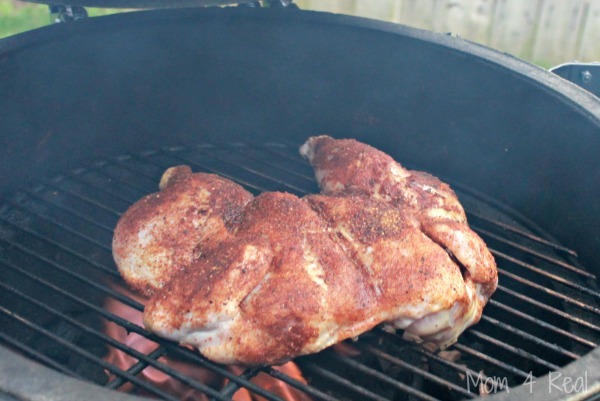 Once your chicken is finished, pull it off of the grill and let it rest for a few minutes so it will retain its juices. 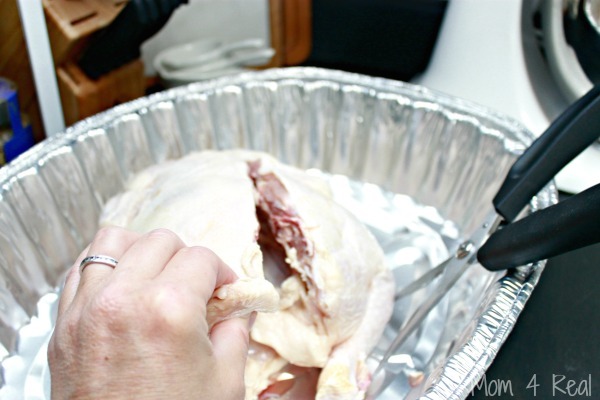 You can use your poultry shears to cut the chicken into quarters or cut the pieces apart. 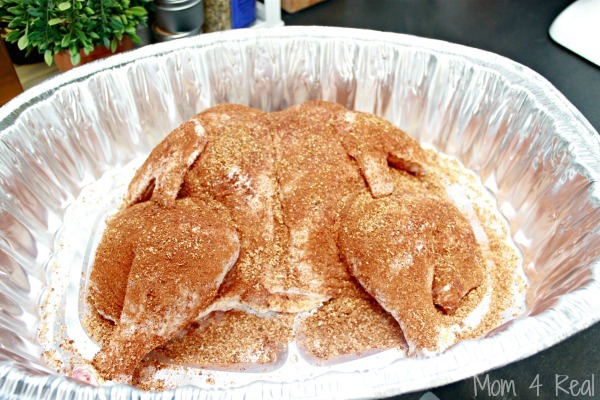 I’m telling you…this will be your go to way to cook chicken from now on. I’m going to make a couple to shred and cut up for salads, sandwiches and soup! No more store bought rotisserie chickens for this girl! p.s. The kiddos loved it too!!! 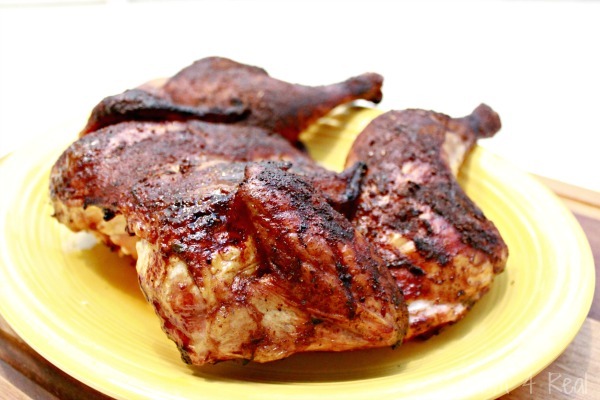 Can you only do this on a grill, or will the chicken retain its moisture in an oven also? So you put chicken on grill skin side up and just leave it like that without ever turning it over? Yes, the heat inside the smoker will brown the skin. You can always flip it if you want the skin to be cooked more. Thanks for quick reply! Am making it as we speak. I love beer can chix so I’m sure this will be great with less cooking time. Hi, I just wanted to point out that the instructions for the spatchcock chicken said to put the chicken breast side up and then cut out the back bone. You may want to correct this so no one cuts out the breast bone instead. hi i cooked my spatchcock chicken in the char-broil big easy oiless turkey fryer,, iI marinated it in nandos medium sauce over night. let me tell you its the best dam chicken i have ever eaten bar none. Spatchcock chicken is one of our favorites. The first time I did one I started it out skin side down and flipped it. When I went to flip it again both the legs departed on their own. Amazingly juicy. We like to do it with Tandoori spices, but just about anything works. Can I get the recipe for the Dizzy Pig Dry Rub? Can I get the recipe for your Dizzy Pig Dry Rub, Also, the link to 50 rub recipes. Thanks. I have a 1” lb chicken to cook. YOu think 3 to 4 hours for cooking time ..